Three months into our funding campaign, we have been encouraged by the outpouring of support. A lot of work is still ahead: while we’re now over 3,000 supporters strong, your contributions remain key for us to invest in new features and improvements to our mobile apps. We noticed that some of our supporters occasionally had questions before signing up. I’ve gathered a few that have come up frequently, hopefully these can clarify a few details. Q: What happened? Why are you running this campaign? A: Over the years, we had primarily been funded by banner ads. Today, ad spending has mostly shifted to a handful of larger sites/social networks. 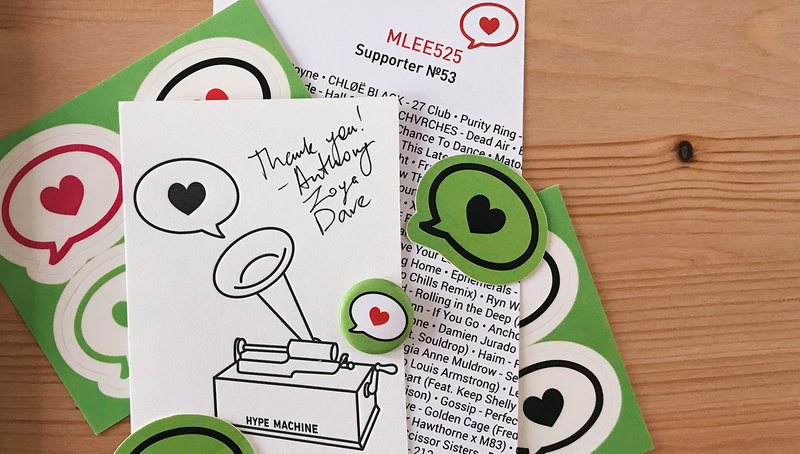 But that doesn’t mean Hype Machine should stop working—there’s still more new music to find! Q: I already bought your app. Why should I pay again? A: Thanks for buying the app! These one-time payments helped its development at the time, but they can’t support our company in the long term. Q: Weren’t you bought by SoundCloud? A: No, we have no financial relationship with SoundCloud. They do host a lot of the music that people are writing about, though, and we have supported their embeddable players since 2008. Q: Can you bring back offline mode? What about Sonos integration? A: We’ve had to remove offline listening from our iPhone app, and make changes to Sonos functionality at SoundCloud’s request. One way to continue listening offline is to sync your favorites with a premium SoundCloud or Spotify account and listen to the playlist in those apps. The playlist will be automatically updated as you find new tracks on Hype Machine, and you can play it on Sonos as well. Link your accounts here. Q: Where will the money go? A: All of the subscription revenue goes to pay for servers (20%), salaries and health care for our team (80%). As more supporters join, we’ll be able to invest in improving our mobile apps and building new features. Q: What do I get as a supporter? A: No ads, access to a supporter-only group playlist, stickers at the $6+ level, and Hype Machine will keep running and making new stuff. More questions? Check out an article discussing this campaign in The Outline, and ask away. If you’ve enjoyed our work, become a supporter. Is there anyway that being a paid supporter can allow access to to songs featured on HypeMachine that become unavailable? I am unable to use the hype machine app with out being connected to wifi. Is there a way around this? Any chance of an amazon echo app coming in the future? That would be great! James – wifi or cellular data is required to play music. perhaps you’ve disabled cellular data for the Hype Machine app specifically? Adam – thinking about that, though play music in the way we normally do (via SoundCloud/Bandcamp/etc) may not be possible there, so will be researching in the near future. Would it be possible to add support for apple music sync? Had a quick look at the api, seems possible in a pretty similar manner to the Spotify api. That’d be ace. Peter – I’d love that! Right now, most of the Apple Music API are iOS-only, which would make this feature hard to automate, but we are keeping an eye on it. Do you get any revenue from our purchasing music through the Hypem iOS app? We do get some (around $0.05 for each $0.99 track), but with the decline of people buying things from iTunes, it hasn’t been much. Why do you have four people employed if you can’t support their wage? Does this site really need four people to maintain it ?